Tanzania is a land of contrasts. From the snow-capped peak of Mt Kilimanjaro to the endless plains of the Serengeti, from the sun-kissed islands of the Zanzibar Archipelago to the gentle shores of Lake Victoria, the country contains immense cultural and natural wealth. With over 25% of the country´s total landmass dedicated to wildlife parks and conservation areas, Tanzania remains wholeheartedly committed to the preservation of Africa’s great wilderness and incredible range of animal species. Tropical beaches, coral reefs and the Swahili culture along the Indian Ocean coast are also a main attraction for visitors who want to end their experience of the African bush with some well-earned relaxation, Zanzibar-style. Tanzania can be visited during all seasons. The weather is coolest and driest from late June to September, with October and November being remarkably pleasant. From late December to February temperatures are high, but still bearable. Tanzania’s oldest park, the Serengeti National Park offers visitors one of the best game-viewing opportunities in the world. The Ngorongoro Crater is the largest unbroken caldera in the world and has been described as one of the great natural wonders of the world. Here you will see an abundance of wildlife hard to describe. A true bucket list experience. One of the world’s largest Game Reserves, the Selous Game Reserve is also home to the biggest elephant herd in the world. About 32 000 elephants roam in the Reserve. During the rainy season, the seasonal visitors scatter over a 20,000sq km range until they exhaust the green plains and the river calls once more. But Tarangire’s mobs of elephant are easily encountered, wet or dry. The swamps, tinged green year round, are the focus for 550 bird varieties, the most breeding species in one habitat anywhere in the world. 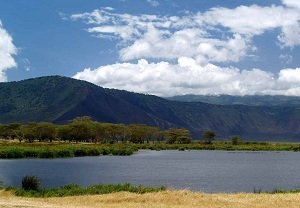 Lake Manyara National Park offers a wilderness experience rich in diverse habitats, from its Rift Valley soda lake to its dense woodlands and steep mountainsides. Apart from a spectacular setting, the park is famous for its unusual tree-climbing lions and the vast elephant herds it was established to protect. The shores of the lake, encrusted with pink flamingo, attract more than 400 species of birds, many of them waterfowl or migrants. Large herds of buffalo, cheetah, Masai giraffe and impala roam the lake shores and the forested valley slopes. Towering almost 2km above the shore of Lake Tanganyika are the beautiful Mahale Mountains. Dar es Salaam, a seaport on the coast of Tanzania, provides tourists with a resting point between National Parks or islands. However, visitors might extend their stay in the city once they have seen its beauty. The forces of nature have worked together to create the magnificent solitary peak of Mount Kilimanjaro, Africa’s highest peak and one of the highest freestanding mountains in the world. Let us know how much time you have, what areas interest you and our expert travel consultants will recommend the best fit for your safari. We will put together a tailor-made Tanzania journey to suit your budget and time requirements. We will also pass on any value-adds possible, such as free nights, free flights and other discounts. Africa Bespoke offers journeys to hand-picked independent camps throughout Tanzania.